Brian Kagan: A brand leadership expert who, for thirty-plus years, has served a range of clients such as Ford Motor Corporation, FedEx, Westin Hotels, Reba McEntire, Tim McGraw, Academy of Country Music, EMI Music Group, Trammell Crow Company, PBS Television. He is passionate about advising and motivating leaders to discover and release the power of their story. Kagan's professional style is driven by a natural talent for guiding leaders and organizations through an interactive process of 1) taking the time to ask the right questions, 2) facilitating robust dialogue, 3) vision casting, 4) uncovering hidden brand leadership assets, 5) defining an organization's individual Brand DNA and Brand Story, and 5) offering relevant, practical and measurable go-forward actions. 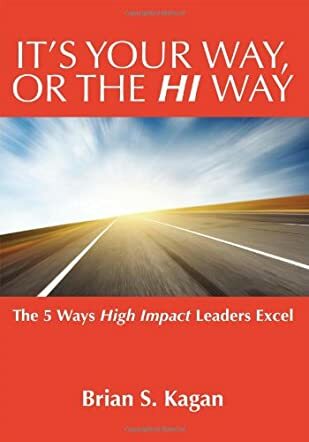 "The 'High Impact Way' is as much, if not more, about getting the most out of your life regardless of your life position," says Kagan. "Every day provides us opportunities to give and receive high impact; the kind of impact that can lead to movements of positive change...for good." "It’s Your Way, Or the HI Way" by Brian Kagan is a book for business leaders about how to lead businesses more effectively, by, as he says, “getting out of their own way.” This book goes over business presence and how to effectively listen, how to motivate others and encourage creativity, how to prioritize, how to achieve a company’s mission the right way, and more. This book also deals with how to manage risky situations, as well as how to say “no,” so you can say “go.” There is also a section about how to properly analyze business failures without finger-pointing. The appendix at the end hits the high (HI?) points in the book, and has exercises that help business leaders and their teams to apply what is in the book. HI means “high impact,” and I think this book does just that. The principles of the FAST and stupid meetings made a lot of sense. I didn’t recognize the examples Brian used about Reba McEntire, but I still learned a lot. Partnering with a situation instead of fighting it, and the concept of “ready, fire, aim” were dealt with while keeping business jargon to a minimum. This book made normally stuffy concepts like meetings, mission statements, and goal setting easy to comprehend. How to create a living learning laboratory was new to me too. Redefining words like “fast” and “fine” was funny, and worked well, based on Mr. Kagan’s context. Using movies and popular culture references to liven up the book breathed life into a normally dry subject. A great addition to any business library.